Crispy Chicken Cordon Bleu – thin pieces of chicken with slices of Swiss cheese and sliced ham. Roll them up and dip in bread crumbs for a super crispy crust. 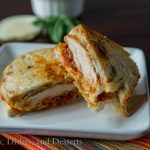 Crispy chicken with gooey, melty cheese. That is what is on the menu for today. Are you excited and ready for it? I think that the melty cheese gets people every time. Especially when you can just see it oozing out. 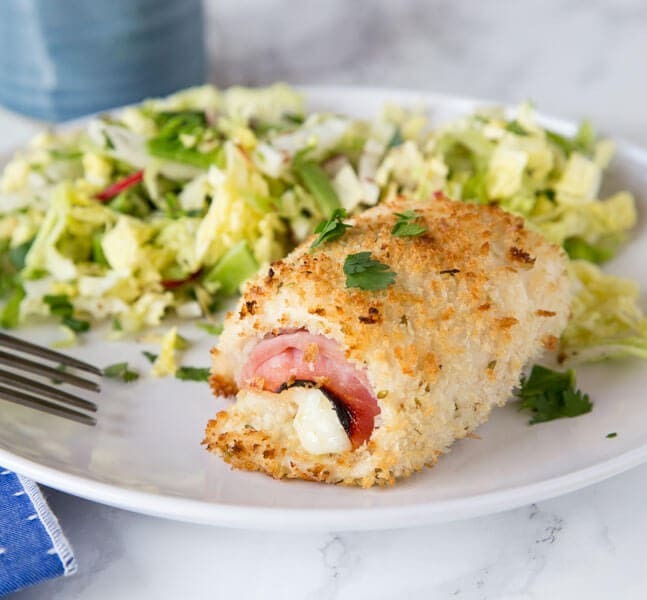 These Crispy Chicken Cordon Bleu roll ups were a huge hit at cooking club last month. 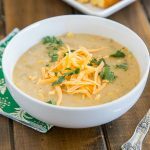 A group of about 7 of us meet 1 time a month to eat lunch together and try new recipes. We always have a theme for the month, but I am not very good at playing by the rules. This year each month we are cooking from a new cookbook. Well I was inspired by a recipe I saw in my Cooking Light magazine, so that was kind of following along. Not the cookbook I was assigned, but no one seemed to mind. The ladies are still talking about the Beef Stroganoff Stuffed Bread I made last time, and that didn’t follow the rules either. So they are used to it. 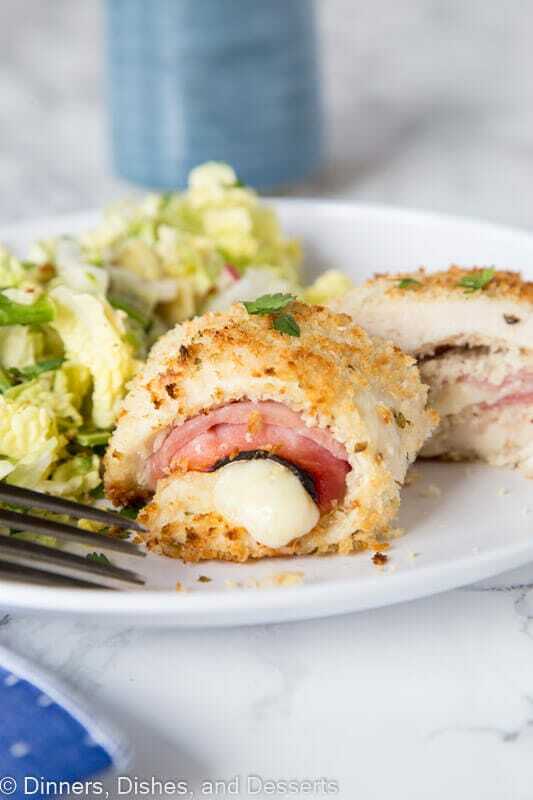 Chicken Cordon Bleu is a recipe that you can make any night of the week. It is so easy to throw together. I am relatively new to the world of filling chicken. 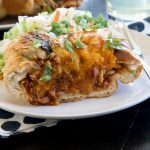 Italian Stuffed Chicken was one of my favorite recipes that I made recently, so I wanted to make something similar with different flavors. 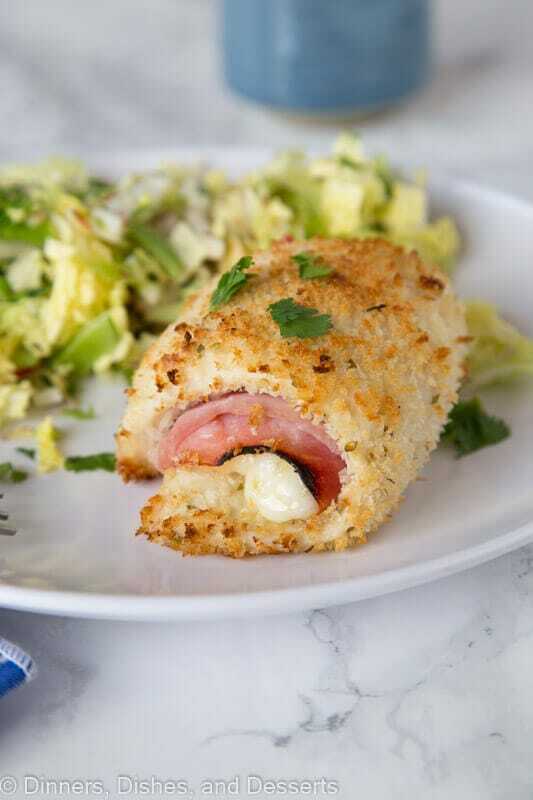 And I am loving that this is baked chicken cordon bleu, a lot that I see are fried. 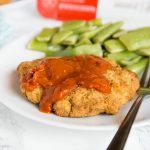 To get the baked chicken cordon bleu super crispy, while the oven is preheating (to a super high heat), you place the baking sheet you are going to use in the oven. The chicken is lightly brushed with olive oil before you dip and roll it, so the bread crumbs stick and get extra crunchy as it bakes. Plus the chicken is baked, not fried, so you can even feel good about eating it. A little cheese is good for you! 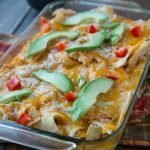 My family ate some of the leftovers from cooking club and loved it. Definitely not as crispy, but still tasty the next day for lunch. I served with a salad, but roasted veggies would be perfect too! 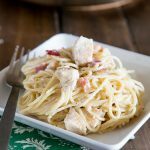 I love how easy this chicken cordon bleu recipe is to make. 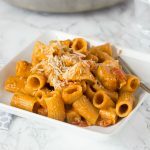 I almost always have the ingredients on hand, so it is something that I can make any night of the week. 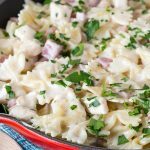 Serve with a salad or roasted asparagus for a meal the whole family will enjoy. 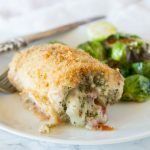 I am sharing this recipe for Crispy Chicken Cordon Bleu over at Food Fanatic today. 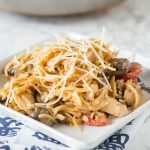 Check out all of the other Easy Dinner Recipes I have made while you are over there! The crisp on this chicken is spot on! Such a delicious dinner that my whole family enjoyed. You had me at crispy chicken! My kids love anything that slightly resembles a chicken nugget. Ha! 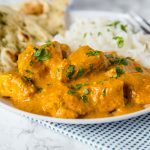 Thanks for sharing this tasty recipe. 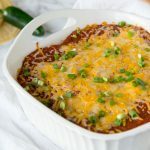 This looks really yummy and easy to make! 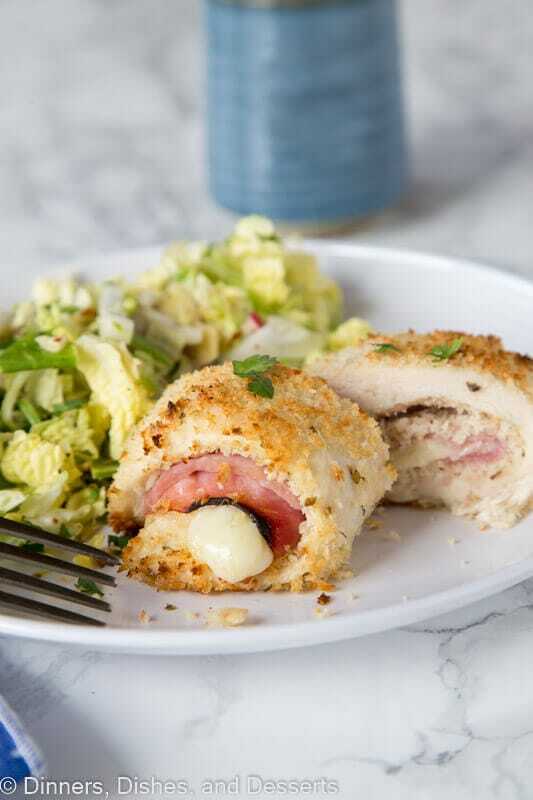 Chicken Cordon Bleu always sound fancy and difficult to make. Gonna try this out soon. Oh my goodness! How crispy and cheesy this looks!